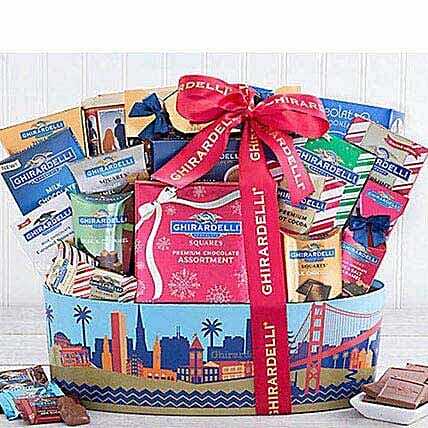 A great selection of chocolate sweets and treats for the Ghirardelli fan that is sure to please, this special collection arrives in a San Francisco theme basket. The Ghirardelli squares come in dark chocolate 60% cacao, dark & caramel, intense dark twilight delight, milk chocolate, milk chocolate with caramel, peppermint bark and peppermint bark with dark chocolate. Ghirardelli dark chocolate drops, peppermint cocoa, Red Thread Ghirardelli chocolate chip cookies and more round out this collection.